Joseph Conrad’s novel Lord Jim contains an important warning for those aspiring to political greatness. Jim is the young man who has everything – good looks, athleticism, energy. He is a ship’s chandler’s clerk working eastern ports – Bombay, Calcutta, Rangoon, Penang, Batavia, always further and further from civilization. In Jim’s mind, though, his fantasy rescues always take place in equally romantic locations and on equally romantic occasions. When, inevitably, the real decisive moment occurs, it’s nothing like he’s ever imagined. Jim signs on as first mate aboard an elderly rust-bucket of a steamship, the Patna. The vessel is crammed with hundreds of Muslim pilgrims travelling to Mecca for the hajj. Halfway through the voyage, at night in foul weather, the ship has a collision and starts taking on water fast, and listing. It seems obvious to the captain and officers that the ship is going down and there’s no time to lose. Nothing can be done and the captain and other crew panic and decide to abandon the ship and its passengers. Jim has a crucial decision to make. Should he honourably stay with the passengers and die, or should he join the other officers and save himself? With deep misgivings, Jim leaves the ship. He and the other officers are rescued and taken to the nearest port, where they tell of the storm and the foundering vessel. But to their horror, the Patna does not sink – it is taken in tow and arrives in the same port next day. Jim has not only blackened his name and reputation, but it was all for nothing. He could have stayed and been hailed as a hero. Instead he must now face a court of enquiry and disgrace. There was no sinking ship, no disaster looming, but a very similar dilemma confronted two of Britain’s party leaders in recent years and both, to their cost, made the same fateful decision as Jim. Nick Clegg was the most successful leader of the LibDem party for decades. Under his leadership, the party gained 57 seats at the 2010 election, and held the balance of power. Clegg could have chosen to seal a political pact with either party. His natural partner in a coalition would have been Labour, the other party of the left. But Labour had been in power since 1997 and were exhausted. Gordon Brown had proved unpopular with the electorate but would not stand aside. So Clegg concluded his deal with the right wing Tory party – not a natural ally. There was a whiff of “power at any price” about this partnership, but most people could see the sense in it. It gave prominent LibDems ministerial roles in the coalition. In retrospect, it’s easy to see that the LibDems exercised a powerful restraining influence on the Tories. And it seemed to them one step closer to real power. But with two such dissimilar parties in power together there was bound to be serious friction and it wasn’t long in coming. 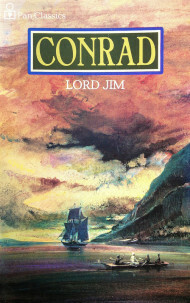 The Lord Jim moment occurred in 2012. Before the election, two years earlier, more than 1,000 parliamentary candidates had signed a National Union of Students pledge to vote against tuition fees. All 57 candidates elected for the Lib-Dems signed this pledge, including Nick Clegg. But now, in 2012, The Tories introduced a bill to raise tuition fees by up to £9,000. Prime Minister David Cameron put pressure on Nick Clegg, now Deputy Prime Minister, to show solidarity and back the government policy. After discussion with his colleagues, Clegg broke his NUS pledge and backed the increase in fees. It’s easy to see why Clegg would have felt compelled to go along with the Tory bill – for all the same reasons that he formed a partnership in the first place: to get his party into power; to prove LibDems could make a difference; to prove to his suspicious new Tory colleagues that he could be trusted, and thus cement the prospects of further collaboration, perhaps in 2015 and beyond. But whatever his reasons, he made the wrong decision. By signing a pledge not to vote to raise fees and then voting to raise fees, Clegg was breaking his word. It didn’t matter what the issues were or who it involved, it was a matter of trust. And once he had broken that trust, he would never be trusted again. He effectively resigned that day. A very similar dilemma befell Jeremy Corbyn in 2016. After decades in the political wilderness of the extreme left wing of the Labour party, Corbyn finally emerged from the shadows to win the Labour leadership contest against all odds. Corbyn was the rank outsider and this stood him in good stead, because the electorate and the party faithful were clearly disenchanted with the elitist metropolitan political class that Ed Miliband and other politicians represent. They had had enough of carefully crafted political PR messages about “ordinary working families” from people who had never had a real job in their lives, and they welcomed the fact that Jeremy Corby wasn’t afraid to speak the truth, however unpopular. And to many people, both inside the party and outside, it didn’t really matter whether you agreed with Corbyn’s politics or not. The fact that he embraced some pretty wacky extreme views wasn’t so important as the fact that he said what he meant and meant what he said, unlike most of the mealy-mouthed Westminster political classes. Throughout his long career Corbyn has espoused some radical political views. He had been willing to talk to Irish nationalists like Gerry Adams in the 1970s, long before the peace agreement. And he had campaigned for unilateral nuclear disarmament, marching with CND protesters. Above all, he had been a lifelong opponent of the European Union and campaigned against its undemocratic ways. So once he was in sight of Number 10 Downing Street – however distant – questions began to be asked. Would he really ban the bomb if he gained office? Did he really consort with middle east terrorists? But no question would prove so tricky as Europe, and no sooner had he settled into his job as Labour leader than Britain was riven by campaigning for the 2016 Referendum on EU membership, and the inevitable question: would Corbyn support the Remain side or the Vote Leave side? Which way would Corbyn jump? Would he adopt the kind of responsible attitude required of a prospective prime minister, that would please the party faithful , and vote Stay? Or would he be true to his own decades long beliefs, tell the truth, and vote leave? In the event, he did a Lord Jim. After years of practicing intellectual and political honesty even in the teeth of the fiercest criticisms, he caved in and gave a wishy-washy nod to the status quo. No doubt he did this for what he considered statesmanlike reasons. But I believe this is a great shame, and a great opportunity missed – regardless of the outcome of the referendum and regardless of the rights and wrongs of the EU. Corbyn is the only party leader in Britain who for a brief moment represented honesty and integrity. People flocked to hear him and support him, not because of his old fashioned Labour views, but because of his old fashioned candour and straight talk and his unwillingness to be bullied into bowing to the consensus of the elite. Had he remained true to his beliefs and supported the Leave campaign he would have proved beyond all doubt that he was an honest man and one who could be trusted even under the most extreme pressure to stay honest. I believe that alone may have propelled Labour to a future victory. The only bright spot to emerge from all this is that, having enjoyed a brief taste of political honesty, the electorate seems to have acquired a taste for it, and may well demand more of it in future. One month after I wrote about Jeremy Corbyn, on 23 June 2016, the majority of the UK electorate voted to leave the EU and Britain is now in the throes of Brexit. So, just like Conrad’s Lord Jim, Corbyn abandoned his integrity for nothing. Had he stuck to his true beliefs, he would have been in tune with the majority of people and a hero of the working class. Yes it was his willingness to speak the truth no matter what that made me admire him . It is a sad that he couldn’t stay strong over the EU.